Same great lotion now formulated WITHOUT PARABENS! 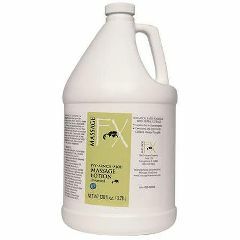 Massage FX Lotion is a light formula that provides extended glide. Absorbs better than most creams and oils. Perfect for facial massage or other areas where less oil is preferred. Ideal for deep tissue work. You will love the healthy glow of moisturized skin. Massage FX Lotion is a non-staining formula that can be customized by adding a few drops of your favorite essential oils. Available in 8 oz bottle with pump, 1/2 gal, 1 gal container and a 5 gallon pail with flip up top. Unscented. Under normal conditions, the shelf life is estimated at 2 years. Please Note:Pumps available for and . Pump for 1/2 gallon may need to be cut to size.